Planning your wedding is pretty much a big undertaking for any busy working couple. The seating-plans for your family and friends can be a difficult task to sort out with both of you trying to keep guests from both sides happy. 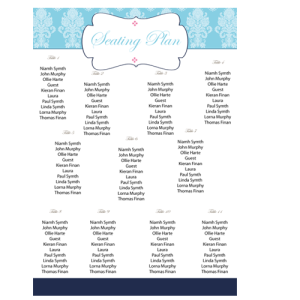 A seating plan is an essential part of the wedding reception because it ensures that the wedding guests move swiftly along to their reception seats without any bottlenecks and it also cuts out your guests’ anxiety trying to look for their place. Ideally you should have at least two copies of the seating plan. 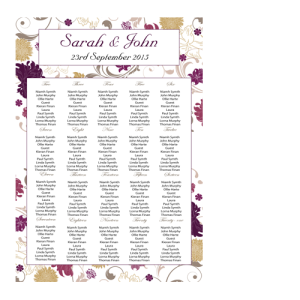 Weddingcardsdirect has two sizes available A2 size seating-plans and A3 size seating plan. Take a good bit of time considering your seating arrangements for your wedding guests ensuring all groups that know each other are seated together. It’s just not very considerate to seat wedding guests at a table who do not know each other remotely. Again, plan ahead for your seating-plans before you go to print with it. For family members this can be even trickier especially if you have children at the wedding. We suggest a kids table for the little guests (if there are more than four) clearly mark the kids table on your seating plan. If your parents have invited some of their friends to your wedding then it’s best ask your parents for advice on seating arrangements here. If you have a large gang of friends who all know each other then split them evenly amongst two tables. Past experience of our team here at weddingcardsdirect attending weddings as guests would suggest that a seating plan placed right inside the reception or foyer area of the hotel or wedding venue is a great way of eliminating any confusion amongst guests when it comes to seating. 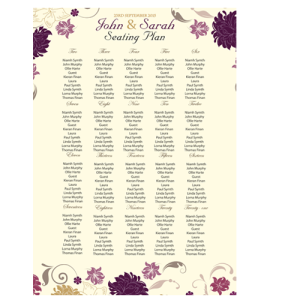 Two seating-plans as opposed to one seating plan is a great idea as it cuts out bottlenecks that can occur around a seating plan. Our A2 seating plans and A3 seating plans can incorporate any design you choose and because they are such cheap and affordable seating plans you can budget at least two seating plans into your wedding budget. 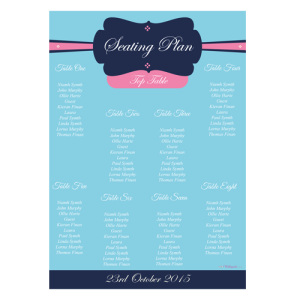 All our seating-plans both the A2 seating plan and A3 seating plan come on high quality matt 350g weight card and can include any design you choose to personalise your seating plan.